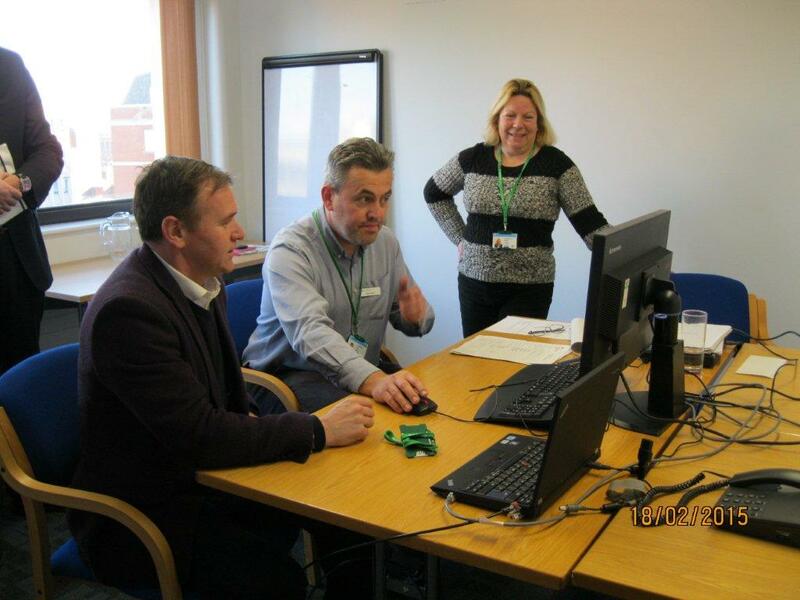 Farming Minister George Eustice visited the RPA’s support centre in Exeter on Tuesday, one of 50 support centres set up across the country to help farmers register online for the new Rural Payments service. The Rural Payments service is the only way to be able to claim, which means that farmers need to register online. Since the launch of the new Basic Payment Scheme this year, around 50 per cent of eligible farming businesses across the country have already registered for the new BPS. According to the latest RPA figures, more than 44 per cent of customers in the South West have registered for BPS so far – with more than half of eligible farmers still needing to register before the 15 May deadline. We want to make it easy as possible for farmers to make their claim this year using the new Rural Payments service, but we know that some people will need extra help this year to get online. That is why the RPA has set up 50 support centres like this one in Exeter to help those farmers who need the most help. I am urging farmers to contact the RPA now so that they can register as soon as possible, and to ensure that no-one misses out on being able to claim this year. We are proud to have had the opportunity to welcome Farming Minister George Eustice to Exeter to see the new service in operation and the support we are offering to local farmers. Our support centre is offering personalised pre-booked appointments and support on how to get online and register on the Rural Payments service, and will remain open until the close of the BPS claim window in May 2015. We advise customers to contact us as soon as possible if they require help to register and claim online. Customers who have not yet registered can contact the Rural Payments helpline on 03000 200 301or visit www.gov.uk/ruralpayments for more information. Registering was straight forward but checking and correcting the fields is a nightmare. The drawing cross will not stick where it is supposed to, the areas seem to be random numbers and it all has to be to the nearest square metre. A lot of work needs to be done on this site to make it sensible otherwise the poor people in the help centres will be overwhelmed. We’re working to improve the service to reduce the number of decimal places presented to 2 when adding the size of a land use or land feature to a land parcel. You may therefore wish to wait until the service is improved before confirming your land parcels. Land parcels. System asked person registering to add information even when details were correct. Needs serious work. May 15th deadline will have to be delayed. There was precedence for this some years ago either with IACS or with SPS. Hello, you do need to confirm that you have checked all of your parcels even if the information is correct. We are making updates to the service to ensure this is presented clearly to customers, where required. Sorry to hear that you are having difficulty. You need to tell us about 100% of your land use for your parcels, so if you are removing a feature you need to tell us what’s on the land where the feature has been placed. We’ve published some guidance that you may find useful, here. https://ruralpayments.blog.gov.uk/telling-us-about-your-land/ If you need further help, please call 03000 200 301. Sorry to hear that you are having difficulty. You need to tell us about 100% of your land use for your parcels, so if you are removing a feature you need to tell us what’s on the land where the feature has been incorrectly placed. We’ve published some guidance that you may find useful, here. https://ruralpayments.blog.gov.uk/telling-us-about-your-land/ If you need further help, please call 03000 200 301.